Gallium nitride (GaN) is a semiconductor that has applications in a wide variety of everyday applications, from high efficiency lighting to superior DC power supplies to communication towers. Unlike most semiconductors, GaN crystals are not the same when you turn the wafer upside down. This TEM can directly image columns of N (yellow) and Ga (red) atoms and determine the polarity of the crystal at different locations. This property has profound influence on the semiconductor properties. Correct identification of the polarity requires calibration of the instrument diffraction angle, as detailed in the related publications. For more information on polarity, see Direct measurement of GaN crystal polarity using STEM. 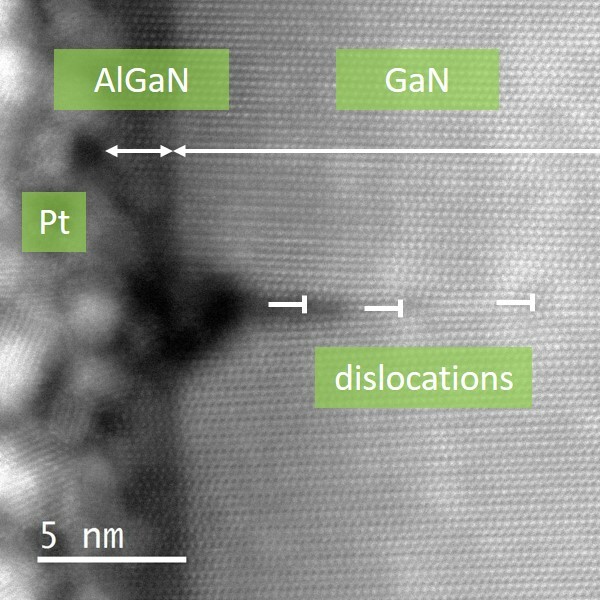 Dislocations formed to relieve stress when an AlGaN shell is grown around a GaN nanowire as revealed by scanning transmission electron microscopy (STEM) annular dark field imaging. Dislocation structure (small cracks in crystal lattice) at a strained interface between a AlGaN shell surrounding a GaN nanowire, both grown with molecular beam epitaxy. Note that the dislocations form during AlGaN growth and penetrate into the GaN. Thickness of the AlGaN shell is approximately 2 nm thick. STEM images like this one help researchers optimize strained interfaces to generate efficient nanowire light emitting diodes for materials analysis, nanoscale chemistry and fabrication, molecule identification and many other applications.